Hampton, VA (USA) -- Nine monks from the Drepung Loseling Monastery in Atlanta will set up camp Aug. 5-11 at The American Theatre in Hampton. Painting, music, dance, lectures, and this year film, will be part of their residency. One of the most colorful aspects of their visit is the creation of the sand mandala, an intricate design made by carefully pouring tiny grains of colored sand onto a large table. Each mandala has a theme, and the monks spend several days creating this work of art on the theater's main stage. Visitors are welcome to drop by and watch them at work. At the end of the week, the mandala is destroyed and the sands are carried to the Phoebus waterfront and poured into the bay. The purpose of this exercise is to suggest the impermanence of everything that is on Earth, says Hampton Arts director Michael Curry. The sand also has received the energy that the monks used in creating the mandala, and that energy is carried by the waters throughout the world to promote world peace. These activities encapsulate the Buddhist philosophy of understanding and compassion, something we can all embrace no matter what are our religious beliefs. The monks' visit also calls attention to the plight of the Buddhist monks who have been driven out of Tibet to settle in Nepal and India. The Atlanta monastery is called the "American seat" or branch of the Drepung Loseling Monastery now based in Southern India. This year, director Rick Ray will be on hand for a screening of his award-winning documentary, "10 Questions for the Dalai Lama." The film details the Buddhist leader's philosophy and the circumstances around his exile from Tibet to India. Members of the local Buddhist community often bring food or other blessings to the theater. When the monks aren't working or rehearsing, they enjoy dinners with community members, basketball or soccer, and trips to the beach. Here's a schedule of their visit. All events are free unless indicated. • Opening Ceremonies. 7 p.m. Aug. 5. The monks chant and prepare the stage for the construction of the sand mandala. 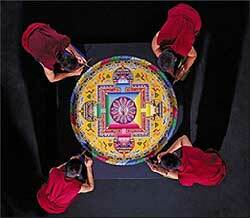 • Construction of the Sand Mandala. 10 a.m. to 6 p.m. Aug. 6-8 and 10 a.m. to noon Aug. 9. Four monks work continuously on the construction of this unique sand painting. • "Opening the Heart, Arousing the Mind of Universal Kindness," lecture. 7 p.m. Aug 7. 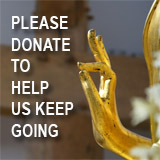 Given by Geshe Lobsang Tenzin, president of the Atlanta monastery. • "Sacred Music/Sacred Dance," performance. 8 p.m. Aug. 8. The monks perform centuries-old traditional dances and music. $25 adults, $12.50 children under 12, available by calling 722-2787 or online at www.hamptonarts.net. 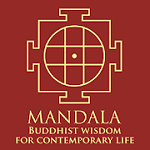 • "The Symbolism of the Sand Mandala," lecture, 1 p.m. Aug. 9. Given by Tenzin. • Closing Ceremony. 2 p.m. Aug. 9. The monks bless the mandala before it is dismantled, and the sands are gathered up and carried to the water. • "Ten Questions for the Dalai Lama," documentary film. 7 p.m. Aug. 10. The screening will be followed by a Q&A with director Rick Ray. $10 at the door. The theater is located at 125 E. Mellen St., Hampton. Call 722-2787 for additional information.